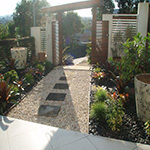 This is an example of a garden created by Bristropical Garden Designs. The brief for this garden was to give privacy and seclusion quickly. Through the use of carefull plant selection this garden has transformed in 2.5 years and the neighbours are now almost a distant memory. 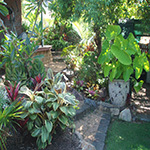 Tropical garden on Bribie Island. 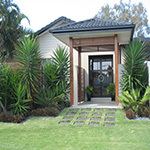 This entrance and courtyard was transformed into a tropical retreat. The first 4 photos were taken 4yrs after planting. The following photos were taken 6mths after planting. Happy kids while mum and dad look at plants!